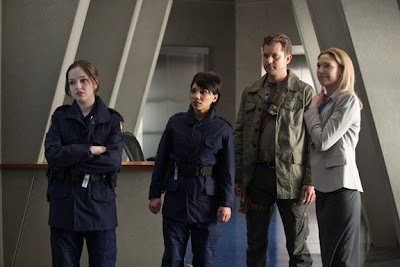 Emily Meade, Jasika Nicole, Joshua Jackson and Anna Torv in "The Day We Died." Photo courtesy of fringetelevision.com. There was a lot to love about this episode of Fringe, and I want to focus on those. So, I'm going to get my minor quibbles with the episode out of the way first. The biggest problem I had with "The Day We Died" was the explanation for why Walter can't change that he sent the machine back in time, but Peter is perfectly capable of recalling his consciousness to the present and changing his actions. I'm normally okay with the pseudo-science of Fringe - in fact, I find it quite entertaining - but there was something blatantly wrong with Walter's I can't change the time frame, but you can work within the time frame explanation. It seemed too much like the writers just invented it to push the plot along, rather than seeming organic to the Fringe-verse. It also worries me slightly; many other shows have gotten bogged down in time travel storylines (I'm looking at you, Lost), and I hope the writers handle this development well. My other (much less important) quibble with the episode was the distracting whiteness of Walternate's hair. I know that he was made up to look older (although, with the exception of Ella, everyone else looked the same age), but his hair looked like it had been made into a bio-luminescent trap by a colony of glow worms. I could barely focus on anything he was saying. Enough complaints. I really, really liked this episode. I really enjoyed Future Earth, and I would love to go back there someday. As I mentioned previously, I was hoping that Fringe would just go for broke and set a good chunk of next season in the future. I knew that wasn't going to happen as soon as Olivia got shot, but I stand by that line of reasoning. There are so many teases of events - like what happened in Detroit, and that shot of the vortex in the Thames - that I would have loved to find out more about, and I really enjoyed the dynamics of the future Fringe team. There were also some great character development moments in the episode; one of my favorites was watching Olivia effortlessly use her telepathic abilities to catch a box that was about to crash to the ground. I wanted to spend more time with that Olivia, a strong, confident woman who is now in charge of Fringe Division and who has honed her powers to the point where she can perform such delicate maneuvers. Anna Torv portrayed Olivia with an effortless confidence that she doesn't usually have, and I loved every second of it. It was an episode of all-around outstanding performances - besides Torv's portrayal of Olivia, Joshua Jackson did a great job showing Peter's anger and despair at Olivia's death, and Lance Reddick was even more imposing than usual with a badass glass eye - but, as usual, one stood out. John Noble's performance as the imprisoned Walter (a man who, in fifteen years time, is blamed for everything that is going wrong with the world) was a delicate balance between a man who has been completely broken and the old Walter, a man with a childlike sense of wonder and scientist's drive to find all the answers. The scene between Walter and Olivia is a lovely, quiet moment in an action-packed episode, beautifully acted by both Torv and Noble. Noble also does a great job with Walternate in this episode, and showing the ways in which Walter and Walternate differ. At their core, they are the same broken man; Walter is broken because of his guilt over the destruction of the other universe, while Walternate is broken because he is the only one left from his world. Their reactions to their grief, however, are completely different. While Walter philosophically waits in prison, accepting his punishment, Walternate becomes more calloused, more willing to take the other world down with him at all costs. The scene between Peter and Walternate is wonderful in spite of the bio-luminescent hair, because it shows that Walternate is a man who has lost everything, and is now willing to do absolutely everything in his power to exact his vengeance. This is not a man who would take joy in the long-missed pleasures of a swivel chair. Of course, while the future storyline was great, the major talking point of the episode was the ending, which I thought was great and promises good things for next season. I really like the idea of the two worlds being forced to work together in order to save both universes, and I look forward to seeing the interactions between Walter and Walternate, Olivia and Fauxlivia next season. In particular, I think that the two Olivias are going to make a great team; they're much less divided than Walter and Walternate to begin with, and we've recently seen Fauxlivia and the rest of the Earth-2 Fringe team becoming suspicious of Walternate's agenda. Plus, the charming and delightful Lincoln Lee (Seth Gabel) was upgraded to series regular for next year, which almost certainly means more involvement for the other Fringe team. I do have a few questions about the ramifications of Peter's disappearance. (And speaking of the disappearance, I really dug the creepy scene in which the Observers, gathered on Liberty Island, explain that he's gone now. It was well done, eerie and explanatory at the same time.) What reasons do the two Walters have for their conflict now? Does baby Henry still exist? Does Peter's non-existence mean that we will no longer have to deal with the love triangle between the younger Bishop and the two Olivias? (God I hope so). I'm assuming that Peter is going to be found/rematerialized eventually, as I can't imagine that Joshua Jackson would be completely written off the show, so what happens when he comes back? Will the others' memories of him come back as well, or will he be a stranger? Basically, I can't wait for Fringe's return in the fall, and I'm so thankful for it's renewal. Because seriously, how terrible would it have been if that was the note the show left us on?